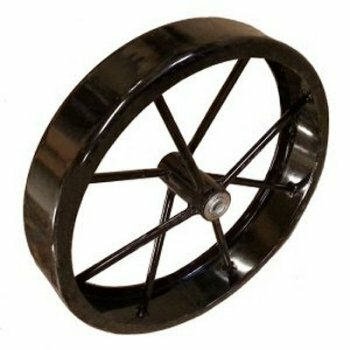 24 Inch Heavy Duty Steel Wagon Wheels, 3" wide, with bearings, these heavy duty steel wheels can be used on Bar-B-Que's and Smokers. Yesterdays Handmade Steel Wagon Wheels, Quality Made in the USA Today. We also make our steel wheels in a 2" wide 1/4 inch thick model on our 10", 14", 18", 24", 30", and 36" steel wheels. If you are not sure which wheel you should use on your project, call us we will assist you in selecting the correct wheel. A one (1) inch bore hub can also be added to the same size wheels. RUBBER CAN'T BE ADDED TO 2" or 3" WHEELS. We ship orders as soon as the wheel is made, please allow 14 days for delivery of wagon wheels. We normally ship UPS Ground Residential or Ground Commercial. If you need faster delivery, please contact us we will try to accommodate your request..
We double check each order for the lowest shipping rate before we ship your order, if we find a lower shipping rate you will be refunded the difference. DIMENSIONS: Steel Wheel 8 staggered spokes, 3" wide, 5/8" axle bore in hub, with two (2) 5/8" ID sealed bearings in a 4" long hub. We Regret That The Minimum Order That Can Be Placed For This Wheel Is four (4)Wheels. Price for ten (10) or more wheels is, 108.95 Each.